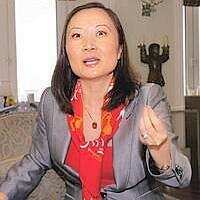 Growth outlook: JP Morgan Securities’ Jing Ulrich. India will have to work hard to catch up with China. That’s the assessment of Jing Ulrich, managing director, China equities, JP Morgan Securities (Asia Pacific) Ltd, who also said that sustaining high growth in India will be a challenge. In an interview with Mint, Ulrich said China would soon become a huge exporter of capital, with some of this money coming to India. I think it’s true to a degree. India’s economy is $900 billion (Rs35.4 trillion) while China’s is $3.1 trillion, four times as large. About 15 years ago, the Chinese economy was roughly where India is today. In terms of per capita income too, India lags China by 15 years and the same is probably true of ­infrastructure. What has happened in China in the last 10 years has no precedent in world history and it’s difficult for any country to replicate the success China has had. In India, GDP growth in the last two-three years has been encouraging, but the question is whether it will be sustainable. What’s your view about that? India has a big problem with employment, with the population growing in every age group. In 2018, India’s population will be bigger than China’s. How do you accommodate all these newcomers in the workforce? You don’t have enough jobs for them. There aren’t enough manufacturing sector jobs available and while the services sector is buoyant, it doesn’t employ a lot of people—the IT industry is a very small sector of the workforce. Fifteen years ago, did China have the negative features of the Indian economy? Not quite. When you travel in urban areas in India, you see very wide income disparities, with magnificent hotels side by side with slums. That disparity wasn’t there in China 15 years back. Also, China’s savings rate was 45% and while India’s savings rate is now looking good, it’s still well below that percentage. Further, 15 years ago, China was beginning to put huge amounts of money in infrastructure. So, will India’s growth trajectory be different from China’s? It’s going to be very different. For example, labour laws in China are very flexible and it’s easier to hire and fire. Is India’s concentration on services also a big difference? I think that is changing and the Indian and Chinese growth models are beginning to converge. For instance, one of the reasons for India’s services growth has been its familiarity with English. But the share of services in China’s economy is growing—350 million Chinese are now learning English. What are the main factors behind China’s success? The single most important factor is high savings and investment. China has plenty of capital with which to develop its infrastructure and manufacturing sector. India, on the other hand, despite higher foreign direct investment in recent years, still has a low savings rate and not enough foreign capital. Are the Chinese stock markets overheated? It’s like letting a tiger out of the cage. There’s so much pent-up demand. 22% of the global population has suddenly realized there is something called the capital market and they’re enjoying making money. They’ve been transferring money out of low-yielding bank deposits to stocks. I’m concerned about high valuations in the Chinese domestic market. But I don’t think there will be a crash—the domestic market will probably underperform the Hong Kong market. But there’s so much money on the sidelines, because they have negative interest rates, due to inflation, which is at a 10-year high. What is the Chinese government going to do about it? They will transfer the liquidity out. You’ve seen the impact that China’s export of goods has had on the world market. Now you’ll see the impact of Chinese capital exports. Chinese capital will be everywhere in the next five years. They would also be interested in the Indian markets. We expect up to $90 billion to leave China by the end of 2008, of which at least one-third will be invested in Hong Kong. One reason for the benign liquidity situation globally in the last few years is because low-priced Chinese goods have flooded the world, pushing prices down, keeping inflation low and allowing central banks to keep interest rates low. If, as you say, Chinese inflation is rising, will this scenario change? Yes, that scenario is finished. The index that measures Chinese export prices has been going up since May. After the US rate cut in September, a lot of money has come into the Indian and Chinese markets, which are perceived as safe havens. Will that inflow continue? In the short term, everyone in the US is looking to emerging markets and to the two biggest giants in the emerging markets. But I’m afraid there’s too much euphoria and the valuations have gotten higher. Too much capital is coming to India and a lot of these portfolio flows are not stable. India needs more long-term capital. Is there a bubble in the Indian and Chinese markets? The Chinese domestic market is really inflated. In India you have some superb companies and banks. From the Chinese perspective, the Indian market is cheap.